A huge welcome to our new friend Mimi (her Chinese name is Wenwen) who newly joined our friends' family last week! If you notice right away that these two look very alike, it's because they are both from the same area in China, an area with lots of people from the Miao ethnic minority group. We hung out at breakfast the other day, and Sojo was a bit unsure of the whole thing and acted a wee bit jealous. She kept taking everything Mimi had out of her hands, including food! If we could have read her mind, I bet it would have been saying, "Hey! Wait a minute! I'm the cute kid everyone always get all excited about! Who's this new girl?" They eventually found a groove, and we're hoping they have lots of playdates together in the next months so they can get to know each other better. A somewhat sunny day got us outside with the bubbles, which is so much more fun than doing it in the living room. We are getting quite excited about moving back to the tropics in a few months where every day can be a bubble day. It was tons and tons of fun until it was time to stop. Sojo's face shows it all--heartbroken that those evil parents of hers made her stop having fun! I read on another gal's blog that her daughter's stomach growled one night and she thought it was hilarious. When it stopped growling, she cried and cried because she wanted the sound back. It appears we are headed down that path with Sojo...armed with patience and a sense of humor as we enter the drama stage. We arrived home one day this week to find Sojo waiting for us outside dragging around this plastic rabbit tied to a string. It seems that someone in the apartment office gave it to her. Oh, and did I mention that it plays REALLY annoying music at a very high pitch AND she was constantly tangled up in the string? Let's just say it was a huge hit with Sojo--so much so that it was causing her stress in that if it fell over, she cried (she's reached the stage of just being so sad when she is frustrated), and it was hard to get her to do anything else but drag the rabbit around the house. Thankfully, there is an off switch for the music, although she figured out later that it she dropped the switch on the floor, it turned on automatically (a bit too clever for her own good!). We had trouble convincing her to leave the rabbit to eat her dinner that night, and the best compromise we came up with was giving the rabbit its own chair right next to her and some carrots to eat. Whew! Crisis averted. A possible solution to the sippy cup aversion that Sojo seems to have. She has taken a fancy to straws! Oh, those poor teacher kids--the ones whose parents have years and years of giving 'timeouts' to students in class and way too many classes on behavior modification. Although Sojo's timeouts started a month or so ago, we now have a special stool where we have the actual timeout. They last only 10 seconds, and really her only major offense is banging us on the head with whatever she can find. She finds it hilarious to do so, and even with a verbal warning (see--total teacher talk!) she has been letting loose. Just yesterday we feared that she was starting to actually LIKE the timeouts because she kept doing the same thing over and over with the result being a timeout. However, we knew we were on the right track today when WHACK! she got me right on the head with a random plastic toy, and I looked at her and said, "If you do that again, you will have a timeout." She then got up and walked out of the room...we followed her and watched her toddle on over to the timeout chair on her own and sat down. Seriously, we had to control ourselves and not fall on the floor laughing because it was so incredibly precious. In her own time, she decided she was done and came back to play--with no more hitting. We're onto something here. She even looks remorseful in this photo! Don't be fooled- this one was taken the day she did it over and over again! Adding one more of our afternoon tea party. She is really getting the hang of it! Sojo and her new "mei mei" (little sister) decided to go for a long walk the other day. She was a trooper and truly did walk for a long time until she was suddenly done and then I had to carry both her and the stroller. Good thing we didn't go too far! She's getting so tall! That dress was well below her knees the last I looked, and her 18 month jeans are getting too short. We're taking her to the doctor this week for the last round of shots, so we'll get her stats on height and weight. Good night, nurse! She is too much...Sojo discovered our box of wigs and boas (for some random reason, it's very Shanghai to have a box of wigs and boas-somehow they come in handy here), promptly gestured to have them put on and immediately headed for the door. Somehow she thinks that once she has something special on, it's time to head out the door. Not sure how she got that because we don't really leave the house wearing boas. Really! Sojo loved the Valentine presents she got in the mail from popo and gong gong, and the dog is getting a love pat in this pic. Tara loves it even better that Little People (Asian girl in the bottom left corner) now come in different races AND all in one box! Three cheers for diversity! This one is for you, Popo, or as Sojo says in the breathiest of voices, "puh puh." My mom has been collecting tea sets for years, just waiting (mostly patiently) for a grandchild with whom she could have a tea party. We bought Sojo her first plastic tea set the other day (look closely to see the teapot), and she has reached that age where she understands how to pretend to pour tea and feed it to her stuffed animals. So, popo, get ready! Sojo is more than ready to have tons of tea parties with you this summer, hats and boas worn as well, both in your desert backyard and by the pond in our special place in Washington. How gorgeous is the knowledge of future memories being seeded in the present moment. Have a wonderful birthday, popo. We all love you so much. We were back to work today, and we both missed Sojo terribly after such fun this past week. I thought I would post a short video of the Chinese New Year fireworks that have been going off almost nightly here and right outside our window. Strangely enough, the child that doesn't always sleep literally slept through every single firework over the break. Hmmm...and when we even cough in the vicinity of her room, we've been known to wake her. Perhaps being Chinese makes her immune to the deafening sound of fireworks? Hide-and-seek is the game of the moment in our house. On the way to the bath, Sojo has taken to hiding in my closet. Makes us laugh and makes me nervous she'll pee on my shoes! One of the memories that has stuck in my head for years was that of our family's Make Your Own Pizza Night. When I was a kid, I loved that we chose our own toppings and got to put them on our little miniature pizzas, and it's something I couldn't wait to do with Sojo. Her friend Jacob and his parents came over the other night, and the two of them squished the dough, put on toppings and spread the sauce around. They weren't too interested in actually eating it, but the making was fun and messy. Plus we parents figured out a while ago that playdates are just as much for us as they are for the kids. With Sojo's hong bao money for Chinese New Year, she chose to buy this Chinese training wheel tricycle (actually, I'm not sure we had a choice with all the excitement she showed when she saw it!). I don't think we have these in North America, but they are great in that they give her a bit more freedom of the road, so to speak. She's not confined, she can hold on to the handles, and we just push it using the stick. Quite brilliant! Of course, I'm thinking there has to be something really unsafe about them or else we'd have them in the U.S. The only downside is that there is nowhere to sleep--I took her out for some fresh air the other day and she crashed hard. At home, she has a blast putting all her stuffed animals in it and pushing them around. As I write this, she is chilling in it with her stuffed bobcat. Big plans for today (love being on vacation at home!) are to give Sojo a haircut! I had a chuckle yesterday because the family who adopted their daughter at the same time as we did Sojo updated her blog, and her daughter has EXACTLY the same unruly hair at the moment AND the same pink princess shoes. Too cute! This new stage of pretend play is so fun to watch. Dale and I quietly sit back with stifled giggles and watch her in amazement. Also, man alive--this child needs a haircut! What is going on with this look?? She has officially reached the disheveled stage. Only problem is she doesn't sit still for more than 2.2 seconds, so I fear the results of the haircut. We were heading to a brunch with friends, so I dressed Sojo and put on a super cute, colorful sweater. Crying ensued, and Dale finally figured out that she didn't want to wear that sweater but instead pointed to what she wanted to wear-- the pink, fluffy diva jacket that is now a bit small on her. So, we put on the diva jacket and then I put on her cute and practical pink sneakers. More crying until we figured out with lots of pointing and a bit of drama that she wanted to wear the pink sparkly shoes that Popo had bought her instead of the sneakers. She's only 16 months old--how she can know what she wants to wear is hilarious to me! The part I find interesting is that a big part of me loves that she is a girlie-girl, but maybe that's because while wearing the pink sparkly shoes, she will also climb to the top of her table and jump into our arms like a fearless girl. Our Chinese New Year vacation started this afternoon, and we are again completely in snowy weather. We opted to stay right here in Shanghai for the vacation since we were a bit too ambitious with two trips and a toddler over the December holiday. This time of year in China is really festive and fun and giddy--fireworks galore (these were much more enjoyable before we had a child who was trying to sleep during them--picture 4th of July fireworks right out your kid's bedroom window! ), red decorations on your door, and the traditional hong bao. A hong bao is money put in a red envelope and given at this time of year to people who work for you. Sojo helped us out today by giving Xiao Liu her hong bao. Actually, she did her normal "walk over and pretend I will give it to you and then take it back at the last moment" routine that is hilarious to her. We had to do the old bait-and-switch so Xiao Liu could get her bonus. 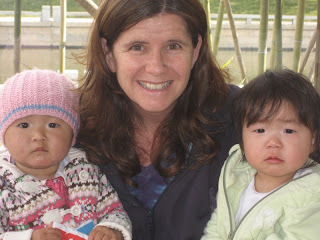 Dale and I are incredibly grateful to have Xiao Liu in Sojo's life as she takes such great care of her and us.